For cancelation of the reservation we accept only written form. All the guests should be members of Hostelling International. Each 21st person in the organized group is entitled to one free of charge reservation. 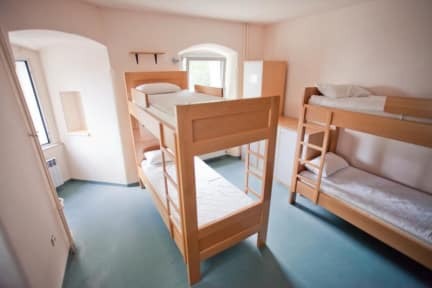 The capacity of the hostel is 61 bed arranged in 13 rooms with central heating and almost every room has TWC. Our private rooms have air conditioning. All rooms have lockers. 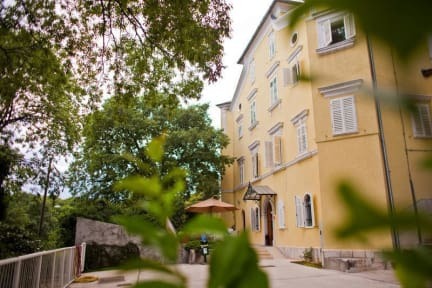 HI Hostel Rijeka offers bed and breakfast and for groups (10+) HB and FB. In the common area there are vending machines for drinks and snacks. Shared dining room is available as well as living room with TV. Free WI-FI is available. In front of the hostel there is a specious terrace with the sea view. The hostel is surronded with park and playground with table tennis while nearby you can find beautiful beaches and tennis corts. Large shopping center is only 1.5 km away. Local bus station (Line 1) is close to the hostel. Free public parking is available on the street. The official bus parking in Rijeka is in Milutina Baraca Street which is 7 km distance from the hostel. THE FRONT DESK IS OPEN 07.00-22.00. All our guests must be members of hostelling international. Daily membership fee is 10.00 kn untill 6 ws (welcome stamps) are collected. At that point you have full membership for one year period. The bed and breakfast price DOES NOT include tourist tax. Tourist tax per person per night is 10.00 kn. Children under 12 do not pay the tourist tax, people between 12 and 29 pay 50% of the tourist tax price. School groups do not have to pay the tourist tax by providing the school-trip approval. L'ostello offre un servizio particolarmente utile a quanti si trovano a dover trascorrere una notte a Fiume. La posizione dove l'ostello è sito non è particolarmente comoda ma con giusta pazienza lo si raggiunge facilmente, grazie anche ai cartelli stradali. Il prezzo è onesto, la pulizia discreta e l'accoglienza eccellente. Buona accoglienza alla reception. Per sbaglio avevo prenotato per due e non è stato possibile cambiare in uno solo. Stanza con due letti a castello, avrei preferito letto singolo. WiFi bene. Bisogna parcheggiare per stada. Colazione decente. Scomodo che esista una sola chiave per stanza. Sono stato una notte insieme a due amici, abbiamo avuto qualche difficoltá a trovare l'ostello in quanto poco segnalato, la camera era molto pulita e confortevole, con bagno privato anche quest'ultimo molto pulito. Con una cauzione é possibile ottenere la chiave di un armadietto per riporre beni di valore. Non c'é un parcheggio privato, ma non abbiamo avuto difficoltá a trovarne uno gratuito sulla strada. La posizione non é delle migliori in quanto distante dal centro. Consigliato.